Spirituality propels one to embark on a divine journey to attain peace and tranquility and one such journey is the sacred Chardham Yatra in the enchanting Garhwal Himalayas. The Chardham Yatra is a magnificent opportunity to explore intriguing Hindu cultures and fascinating snow-clad Himalayan beauty. 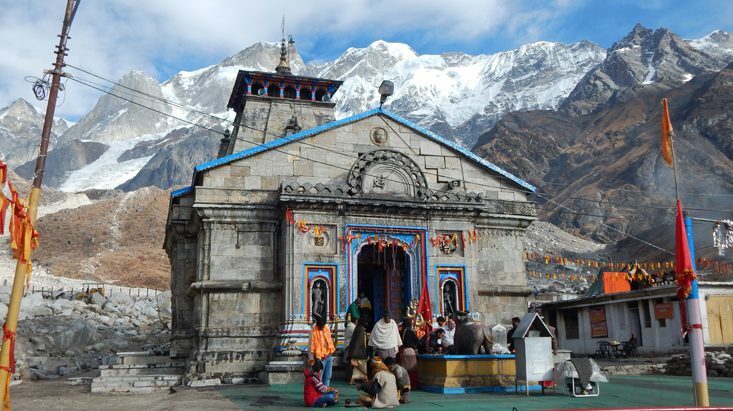 The Yatra – a trip through four prominent holy destinations – Yamunotri, Gangotri, Kedarnath and Badrinath (also known as four ‘Dhams’) is nothing less than an unforgettable experience for the devotees. How to Prepare Yourself for the Divine Yatra? Devotees from various parts of India and the world undertake this pious Yatra to seek blessings of the almighty and get mesmerized by the natural charms of Uttarakhand. However, the beauty and challenges of visiting the four Dhams lies in completing the Yatra without any inconvenience. Gone are the days, when the pilgrims had to bear many hardships to undertake the journey successfully. With the passing of time, top-notch facilities have opened gates for the devotees to reach the abode of Gods with ease. People making plans to go on a Chardham pilgrimage must prepare themselves to conquer many challenges like the bumpy mountain roads, crossing rivers, walking in high altitudes, rugged terrains, drastic change in temperature and many other things. Thus, before you pack your bags and head off for this holy journey, there are a few important things that must be considered to make the Yatra a memorable experience. What is the Best Season for Undertaking Chardham Yatra? The first thing that you must ponder upon is when to perform this religious journey. The sacred Yatra begins from April – May and is open till Diwali (October-November) each year. The Yatra remains shut during the winter season due to extreme climate. The peak time for the Yatra is from May – June and September-October. Travelling in the months of as July and –August must be avoided, as during this time the Garhwal region witnesses’ heavy rainfall that can lead to many problems. The threat of landslide and heavy rainfall looms large during these months. The month of September is considered to be ideal to plan for the journey because after the rains, the beauty of the region amplifies with the awe-inspiring views and verdant landscapes. The beauty of whole area casts a magic spell upon the pilgrims as they are charmed by the breathtaking scenic views. How to Choose the Best Chardham Yatra Travel Package? There is absolutely no doubt that the Chardham is the most popular pilgrimage circuit for the devotees and because of this reason, you can find a lot of tour operators in the market happy to offer you a package terming it to be beat and affordable. However, it is imperative that you carry out an in-depth research before you decide to purchase a package. If you are a first time visitor, then you can take the assistance of your friends or relatives who have used the services of a tour operator before. You must make sure that the package you are planning to get must include various things like accommodation, food, transportation and other facilities. Utilizing the services of a reliable operator will help you get rid from all the stress of the tour. As mentioned before, the journey is very challenging and demands lots of physical fitness and stamina. People suffering from acrophobia (fear of heights), high blood pressure, asthma, heart disease and other diseases must refrain from carrying out the journey. It is important that they get a proper medical checkup done from their doctor and get a certificate from him regarding their fitness for the proposed Chardham Yatra. The Yatra involves lots of walking and this can pose a lot of problem, particularly for the older members of the family who are not used to long walks. In such a situation, you can take regular breaks in between the journey to give your feet some rest and feel refreshed. What Problems you might Face in the Mountains or Higher Altitudes? As most of the temples are located in the high altitude mountain regions, there are some problems that the devotees can encounter. Many people suffer from attitude sickness (fear of height) and they may also find it difficult to acclimatize to the weather conditions properly. These people must consult doctors before embarking on the journey. It is also vital to carry a first aid box containing items like thermometer, balm for muscles/joints, adhesive rolls, band-aids, cold cream, bandages, antiseptic ointment and medicines prescribed by the doctor. Why Booking an Accommodation in Advance is Important? It is vital to select a comfortable accommodation in advance to complete the Yatra successfully. There are many hotels and resorts that are situated on the Chardham circuit. The devotees can hotels en route to Chardham according to their need and budget. The hotels leave no stone unturned to provide excellent services and amenities to their guests. All the desired facilities like attached bathroom, television, spacious rooms, telephone, etc are provided by the hotels which make the tour pleasurable and memorable for the pilgrims. Now, the main question that pops out is where would those persons eat who fail to get an accommodation due to late bookings, heavy rush or various other reasons. There is no reason to worry as there are many good eateries, restaurants and dhabhas that are located in and around the Chardham region. The devotees can enjoy lip-smacking hygienic food like Parathas, Maggie noodles, North and South India cuisines at nominal prices. An important point to note here is that non-vegetarian food and alcohols are strictly not allowed or served in the hotels and restaurants. Most of the shrines are located on higher altitudes, which make them prone to extreme weather conditions like heavy rains, snowfall, cloud burst and landslides. The temperature of the region tends to change drastically and in such a situation, you must stay updated about the weather conditions of Chardham on a regular basis. This can be done by getting the weather update about Garhwal through online or the best thing you can do is to seek the assistance of a local guide because they are quite familiar with the prevailing weather conditions of the region. What is the Best Route to Follow During the Yatra? Generally, the Chardham Yatra is carried out by the devotees from the west to the east. It signifies that the journey starts at Yamunotri, and passes through Gangotri, and then Kedarnath before ending at Badrinath Dham. If you are too pre-occupied with your work, which is very common in our monotonous lifestyle, then can you plan a Chardham Yatra through helicopter. By availing the helicopter services, you will not only save time but also explore the natural beauty and places of religious significance easily. The helicopter service starts from Delhi, Dehradun and covers various important religious places of Haridwar and Chardham. The helicopter services are provided by the Pawan Hans Helicopter services and Prabhatam Aviation Private Limited. While visiting the shrines, it is important that you remove your shoes and cover the head with a napkin or clean cloth. Carry warm clothes if you are travelling in the winter season. Do make it a point to carry a blanket, raincoat, torch, muffler, sweater and canvas shoes. Pack chocolates, dry fruits and glucose for the journey as they can provide you instant energy if you feel tired. Do not carry any precious items like the jewelries, credit/debit card and any other thing. Keep these things in your hotel. Taking pictures inside the temple promises are not allowed. It is pivotal that you do not hurt the sentiments of any particular region. Drink only packaged or boiled water. Always travel in groups because if you face any difficulty, then your friends or relatives can provide you assistance. Women must avoid wearing sarees as they would find it very difficult to walk. Instead of saree, they can go for the salwar kameez. In addition to the above mentioned points, carrying out the necessary research and carrying a route map along will help you to get rid of any problems that you may encounter during the course of the journey. These are some of the important information of the Chardham Yatra travel guide that will help you a lot to complete the religious journey, in the beautiful Himalayas successfully and cherish the wonderful memories.